Pudget: Losing Weight On a Budget! : Product Review and Giveaway!!! Check out this great Giveaway. Nyky from The Crazy Crabb sells Tupperware. She will be giving one lucky winner this great Tupperware Water Bottle. I have one of these and I absolutely love it. I seriously carry it everywhere I go. It fits great in my purse and my diaper bag. I take it to the gym, to church, to the mall, to my sister's house (she picks on me for that) and pretty much everywhere else I go. It would be very strange to see me somewhere without my Tupperware Water Bottle. I bought the Tupperware Water Bottle about two months ago and after the first use I fell in love with it. The number on reason is because it doesn't leak. Ever!!! It has been in every bag I own upside down at one point or another and can you believe it has never leaked? Sounds crazy but true. Reason number two is that it is so cute. Reason number three, it holds 27 ounces of water. Reason number four, it has a snack container on the bottom. I usually store some almonds or my MP3 player when I am not using it. Number five, It is reasonably priced. 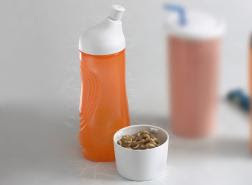 I know that I have mentioned before that I love Tupperware but I will tell you that this is my favorite piece. I get so much use out of it. I have used it everyday for the last two months. I think I am hooked. I have several other water bottles but the only reason I would use them anymore is if somehow I lose my Tupperware one. 1. Visit Nyky's Tupperware website and come back and tell me what product you feel would help you the most on your weight loss journey. 2. For a second entry include a link to my blog on your next post and post the link in the comment section. 4. For a fourth entry add my button to your blog. Winner will be chosen using a random number generator. All entries must be received by Tuesday, January 19, 2010 at 11:59 CST. The winner will be announced Wednesday, January 20, 2010. The prize will be sent to the winner directly from the Tupperware Rep. The product that would benefit me most would be the Servalier 3 pc. Bowl set. The bowls would be great because I am buying only fresh ingredients and I have only 1 large bowl in which to mix my meals in. I love the lids. They would be a great help to keep healthy meals stocked in the fridge in case of unscheduled interferences. I am already a follower! I love this giveaway! Oh and i follow you!! I like the Ideal Little Bowls. They look small enough that I could put a snack in for a day, that way I know how much snack I can have and not over-do it. I also like the sports water bottle that is the prize. I would use that a lot while working out. I would pick the water bottle too, I do so much better when I drink enough. I've yet to find one that doesn't leak. I'm now a follower(though I've been reading your blog for about 8 months now). I think a water bottle is always a good tool! I am now a follower...YEH. Looking hard through the tupperware page i kept coming back to the cupcake holder but thought that might not assist me loosing weight. I love the water bottle. Mine always leak! I'm a follower. Awesome blog! Rachael~ I like the bottle because you know it's yours, and don't have that fear someone else drank out of it! I can't enter...because I am giving it away! Love your blog. I love Tupperware! I already keep one of the 16 oz. tumblers on my desk to keep filling up with water, so the water bottle would be a great alternative! Honestly, I think the feeding set (for kids) would help me the most. If I didn't have to worry about her food touching, which she hates, I could worry a little more about my own food! I'd pick the water bottle too. I need to remember to drink enough water.